In relation to enforcement of the new product tracing requirements under the Drug Supply Chain Security Act (DSCSA) requirements, pharmacists must receive and store transaction information, transaction history, and transaction statements for drug products at the lot level from wholesale distributors by November 1, 2015. DISPENSER.—The term ‘dispenser’— (A) means a retail pharmacy, hospital pharmacy, a group of chain pharmacies under common ownership and control that do not act as a wholesale distributor, or any other person authorized by law to dispense or administer prescription drugs, and the affiliated warehouses or distribution centers of such entities under common ownership and control that do not act as a wholesale distributor; and (B) does not include a person who dispenses only products to be used in animals in accordance with section 512(a)(5). EXCEPTION: The dispenser requirements for product tracing and verification shall not apply to licensed health care practitioners authorized to prescribe or administer medication under State law or other licensed individuals under the supervision or direction of such practitioners who dispense or administer product in the usual course of professional practice. The below is the responsibility of the individual pharmacy and their trading partners, not related to GuardianRx functionality. 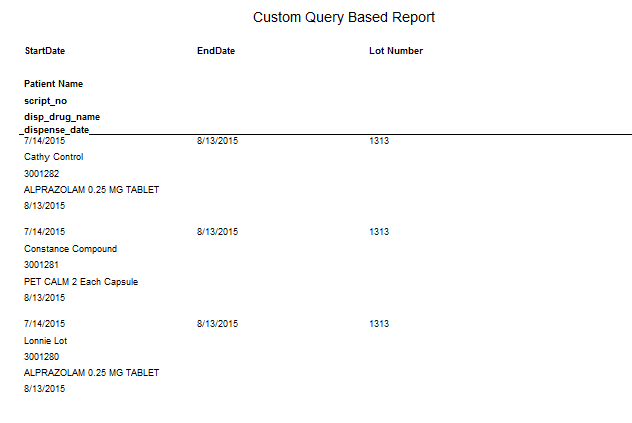 The below functionality is available in GuardianRx to enter data and track and trace as these products are dispensed. (ii) Prior to, or at the time of, each transaction in which the dispenser transfers ownership of a product (but not including dispensing to a patient or returns) shall provide the subsequent owner with transaction history, transaction information, and a transaction statement for the product, except that the requirements of this clause shall not apply to sales by a dispenser to another dispenser to fulfill a specific patient need; and (iii) shall capture transaction information (including lot level information, if provided), transaction history, and transaction statements, as necessary to investigate a suspect product, and maintain such information, history, and statements for not less than 6 years after the transaction. 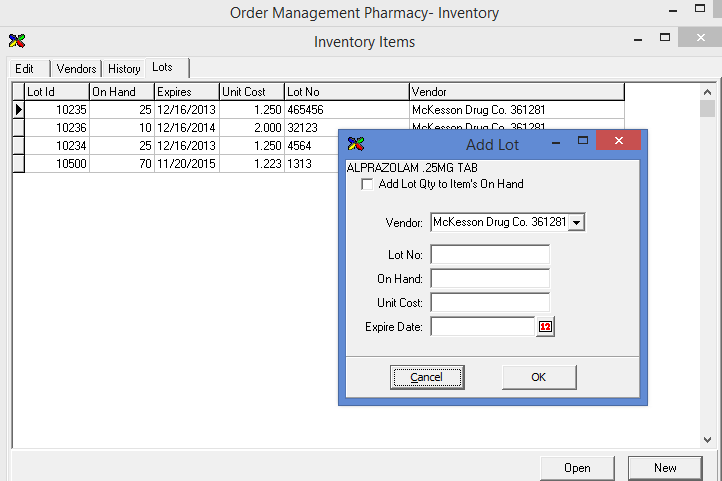 GuardianRx users have the ability to input lot number information from the wholesaler/manufacturer on the inventory item record, these can be assigned/linked to the Rx for the product at the dispense verification step in workflow. It is optional to require lots tracking for regular Rx’s. If you use the Advanced Compounder, the lot assignments are required to complete the verification. Ingredients of compounds will be traceable as long they have lot numbers assigned. Compound entities will also be assigned lot numbers. 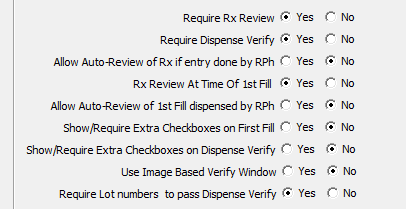 Verify Dispense/Lots tab shows available lots to link to the Rx. 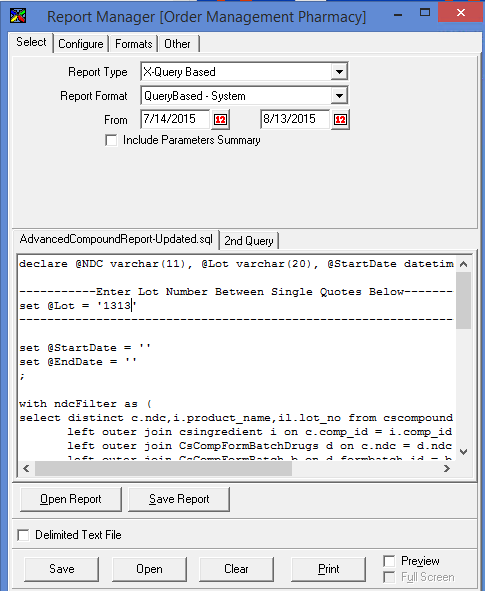 Report tracking per lot number is available as Xquery “AdvancedCompoundReport-Updated”. 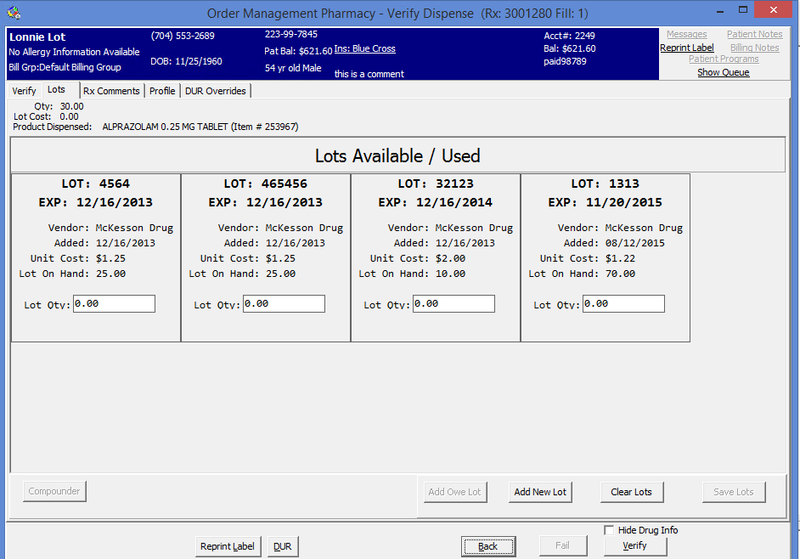 Processing History which includes each transaction on the related Rx, is obtained from F11 on the Patient Profile or when the Rx is pulled up on screen.